KLM Royal Dutch Airlines flies to 95 destinations in Asia. New Zealand business travellers have the opportunity to fly to Amsterdam / Europe from any of the above destinations in Asia on a KLM ticket. 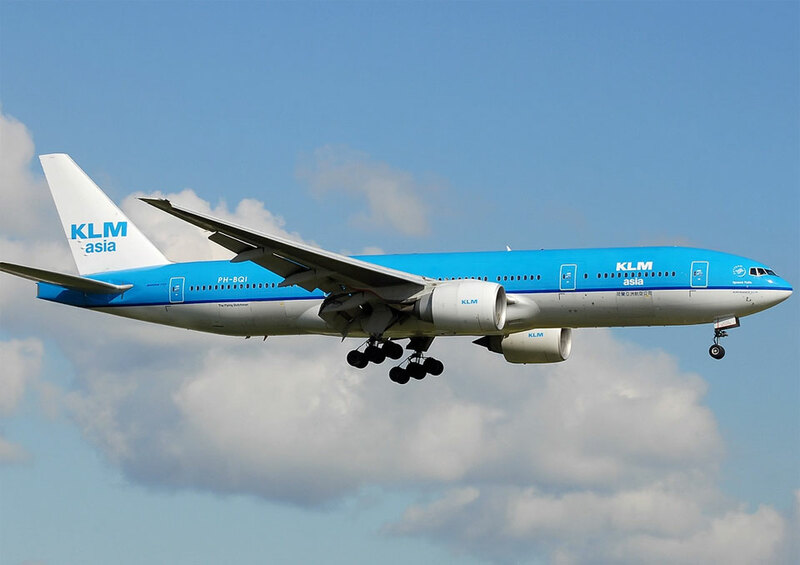 While not flying to New Zealand directly, KLM through its partner airlines (mainly Malaysia Airlines and Air New Zealand) offers a wide selection of flights to Asia before connecting on a KLM service to Amsterdam. 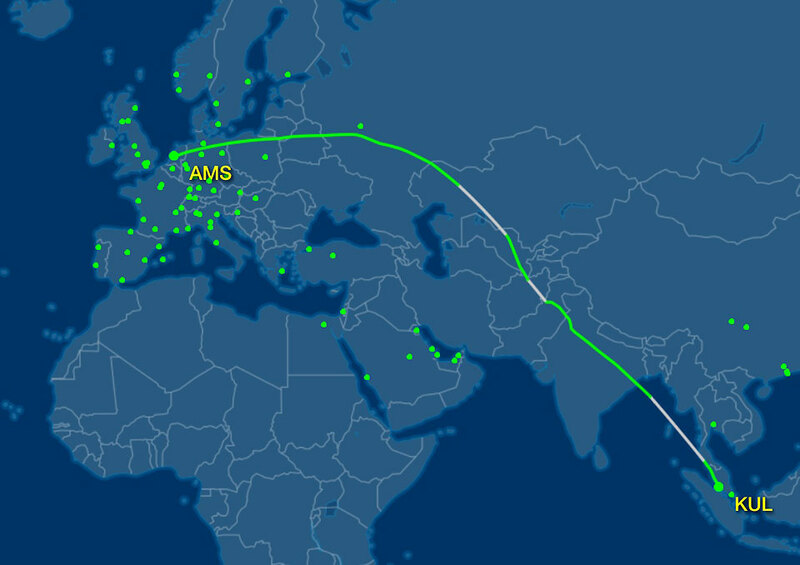 KLM operates a Boeing 777-300 ER from Kuala Lumpur to Amsterdam which is a hopping flight arriving from Jakarta to Kuala Lumpur and onwards to Amsterdam. KLM flight 810 departs from Kuala Lumpur International Airport Terminal M. Check-in counter J5 is business class checkin for KLM. 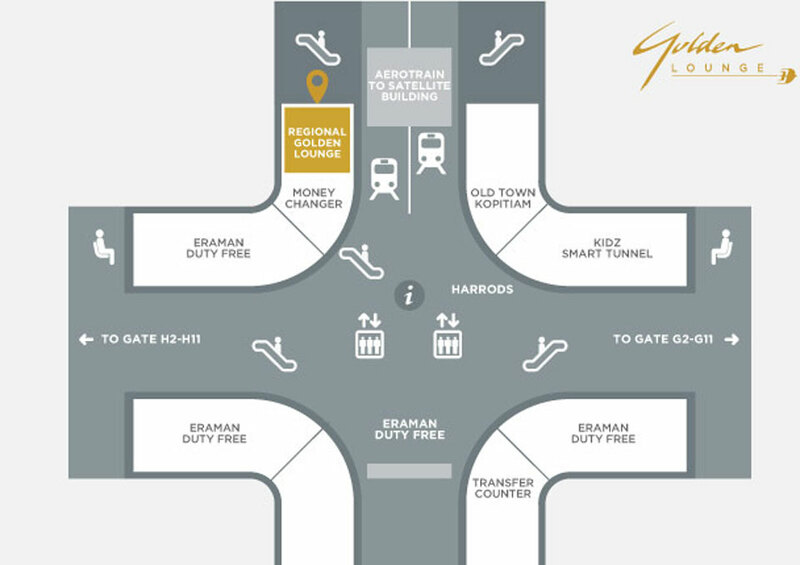 Sky Priority and business class guests have access to fast track lanes and priority boarding. KLM Business class guests are invited to the Malaysia Airlines Golden Lounge at Kuala Lumpur International Airport. 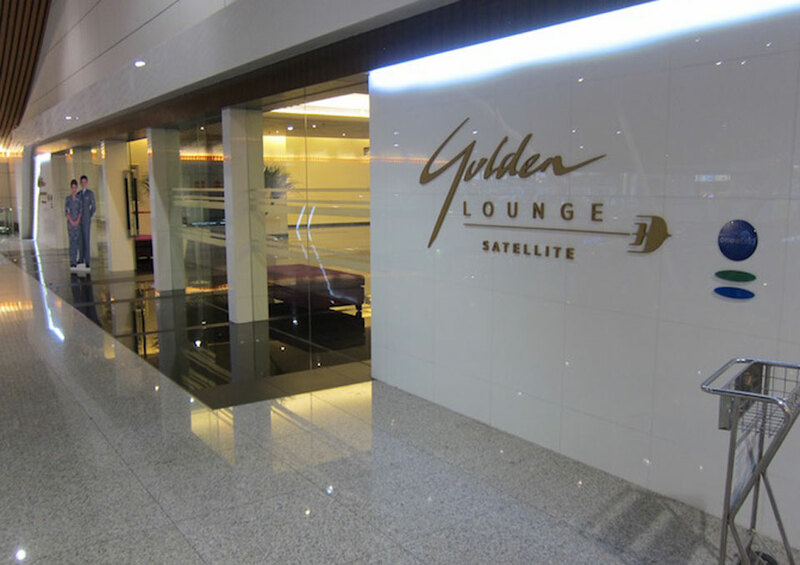 Malaysia Airlines is currently upgrading the Golden Lounge and KLM guests are now invited to use the Malaysia Airlines Regional Lounge located above the Aerotrain terminal to the satellite building. 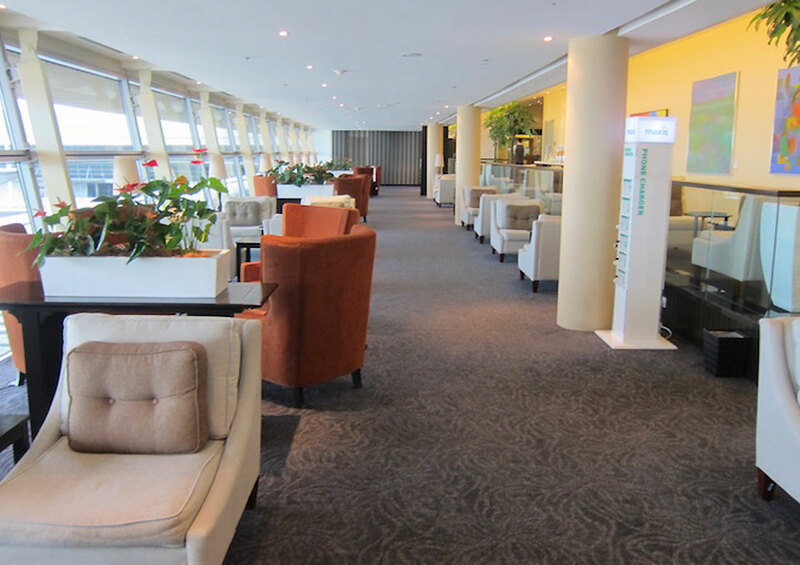 Although not as glamorous as the Golden Lounge, the Malaysia Airlines Regional lounge offers extensive and comfortable seating areas, a good range of hot food and a selection of salads, breads. A functional bar offers a range of cold beers, alcoholic and non-alcoholic beverages. Our flight was delayed due to the late arrival of aircraft from Jakarta. The crew was diligent in advising the passengers. As the passengers were awaiting boarding in the gate-lounge, the Captain of the flight came on the intercom to address the passengers, apologise for the delay and give a detailed plan of departure. A very professional and kind gesture to address the passengers who waited long and came across as a genuine feeling of appreciation. Boarding was at gate C3 and was swift for Sky Priority customers. 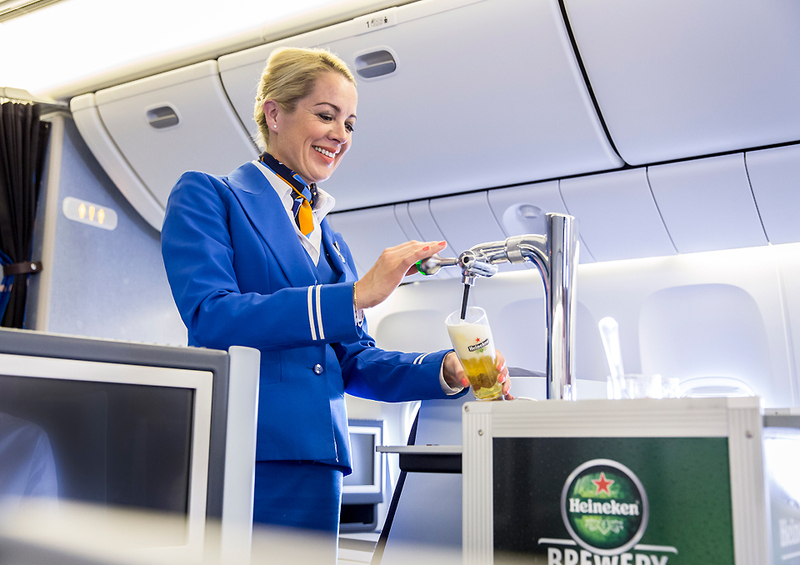 I was introduced to my seat by the experienced KLM cabin crew, my jacket received and a welcome drink offered. It wasn’t long that we pushed back and were on our way. The flight was smooth all through with the odd turbulence. 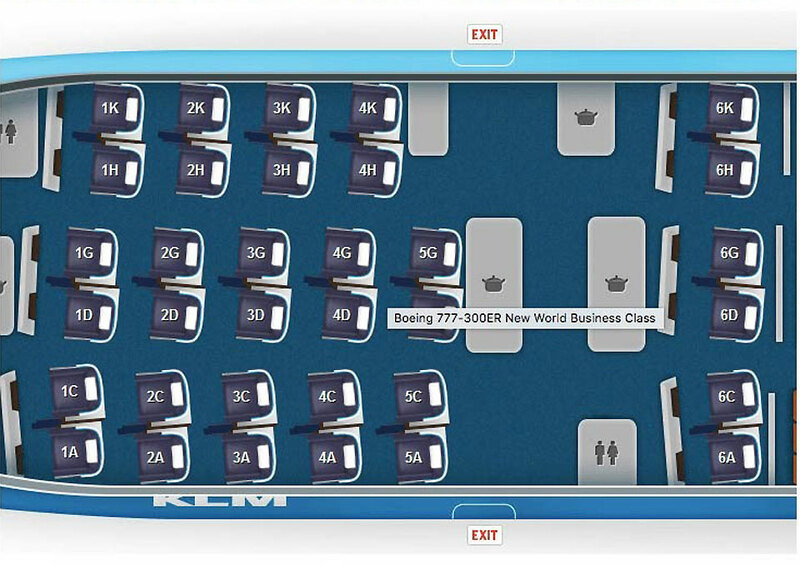 The World Business Class cabin on-board the KLM flight is truly inviting. The cabin configuration is 2-2-2 offering guests choice of window or aisle. The seats are positioned ergonomically pointing on an angle away from the centre of the cabin giving a roomy and a spacious cabin feel. The seats are coloured is a light blue textured colour that reflects the soft, white cabin light adding to the ambience and spacious sensation. The seat is one of the most comfortable in its class and is a good combination of softness and firmness. It contours perfectly with the back and the lumbar area and is suited for a long or an ultra-long haul flight. Without exaggeration, a snooze in this seat will feel better than most hotel beds that you’ll experience. Dutch industrial designer Hella Jongerius has contributed to the cabin and seat design. Hella perfectly blends signature colours of KLM and provides depth with deeper tones of purple and brown. 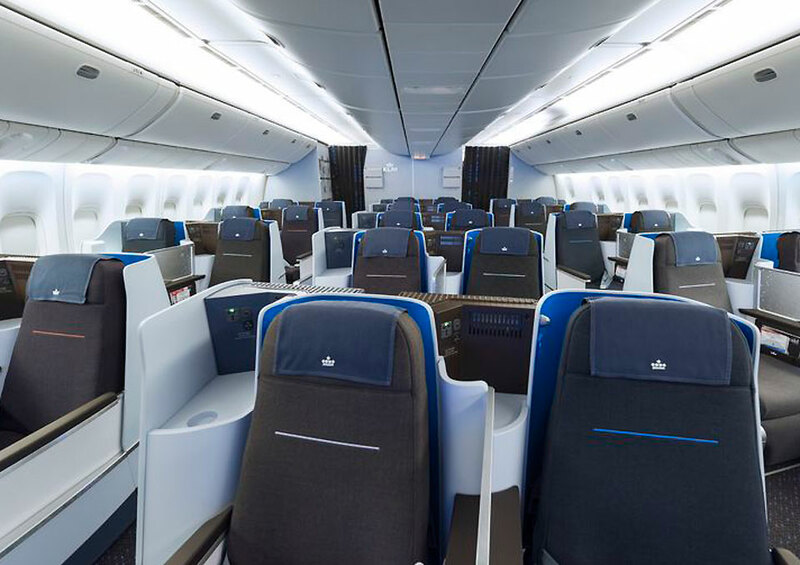 The turquoise flecks in the carpets are made on recycled KLM flight attendant uniforms. The seats are designed by B/E Aerospace and are customised diamond seats. While some would argue that these are all considered outdated as the newer version of the diamond designs are in play, The KLM seat still works great. Its converts to a full-flat bed with the flexible armrest and comfortable sleeping on any angle. The seat is 2o inches wide with a 63 inches of pitch. Each reclines to a fully flat-bed up to 81.5 inches long. This increases slightly if armrests are lowered. Running parallel to each other, the seats are configured in two-seat blocks. Permanent metal privacy screens with pattern of a cluster of stars separate the seats. The seats offer pre-set takeoff, landing and sleeping positions to keep things simple and easy to operate and in the upright position the seat is a comfortable chair. Plug in points including a universal power port, USB and headphone jack for the earphones are conveniently placed next to the headrest with ease access and not having to scrounge around for the same. Pillows and duvets are plush and cosy and provide much warmth. 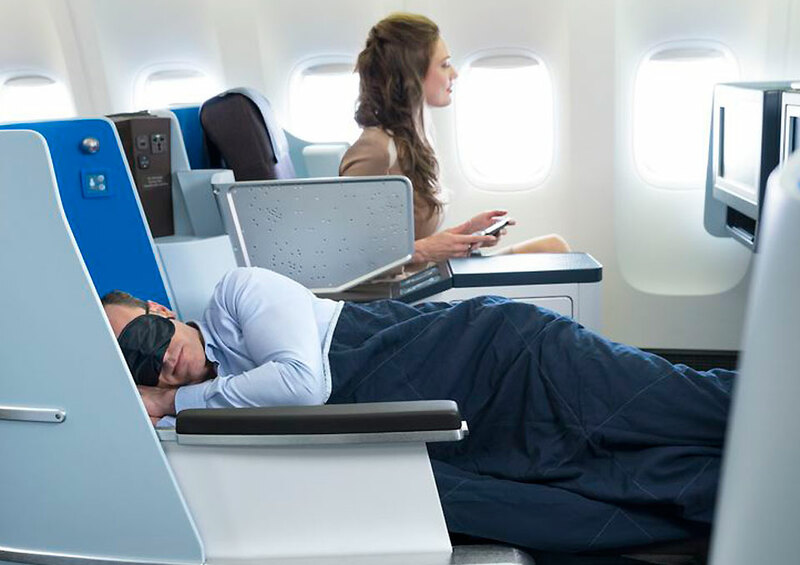 All up, the KLM business class seat is perfect for a comfortable 6-8 hour snooze of a long-haul flight. There was no WiFi on the flight. Welcome drinks were served once seated and the Champagne of the day was Nicholas Feuillate. The crisp chilled bubbly was a perfect way to settle in after a long wait. About thirty minutes into the flight, warm nuts were served with another round of drinks. KLM’s signature cocktail ‘The Flying Dutchman’ was on offer too. Mixed especially for KLM by legendary Dutch distillery Bols. The refreshing cocktail uses Damrak Gin, Bols blackberry liquer, fresh lemon juice and sugar syrup. KLM’s wine list is directed by wine expert Hubrecht Duijker, recipient of the Julia Child Award among other distinctions. For appetiser, there was Smoked Salmon tartare, mango salsa and tuna tataki. The lightly smoked salmon matched perfectly with the freshness of the mango salsa. For the main course, I chose the Chicken Biryani with roasted cashews and fried onions. The chicken was succulent and the rice was puffy and flavoursome. For dessert there was chocolate profiterole and strawberry cake. 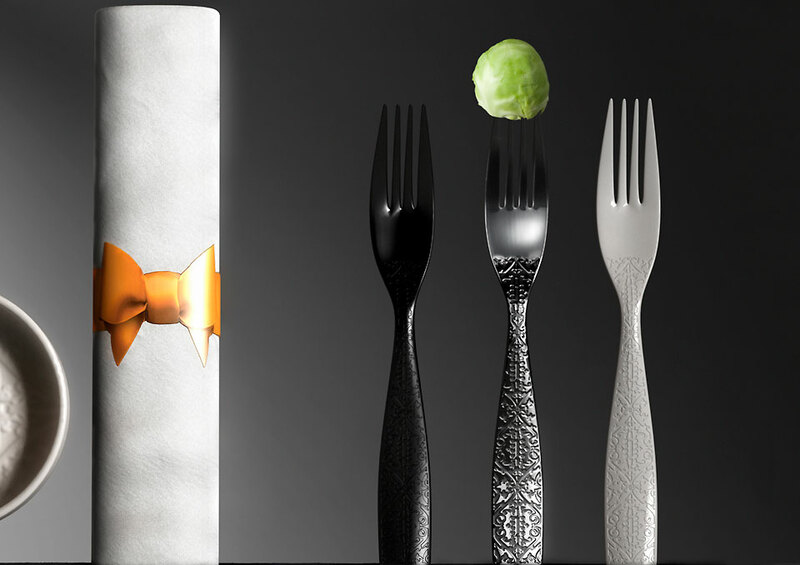 Marcel Wanders is the brainchild behind KLM presentation of cutlery, crockery and menu design. Known for his daring, surprising but about all entertaining creations, Marcel has been creating business class products for KLM since 2011. 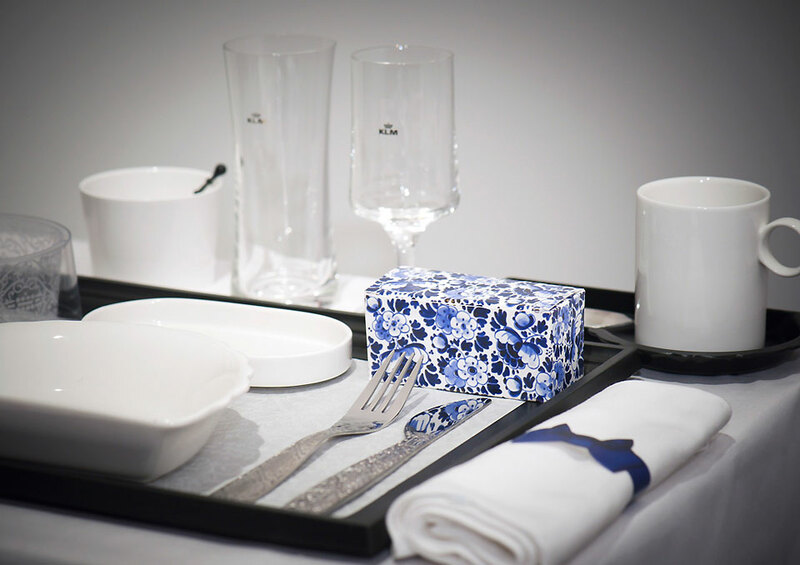 The plates and bowls are a testimony to famous Delft blue tiles and the cutlery handles’ design portray the intricate Dutch lace. The stemware is delicate and light and perfectly complements the expensive wines that are served in them. 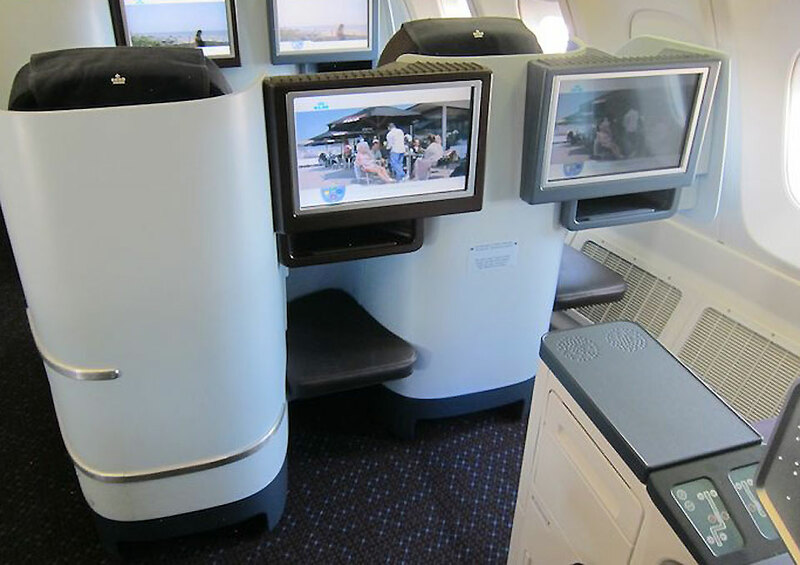 World Business Class seats have 17-inch Panasonic ex3 entertainment screens offering crystal clear reception and a choice of over 350 movies and TV content. 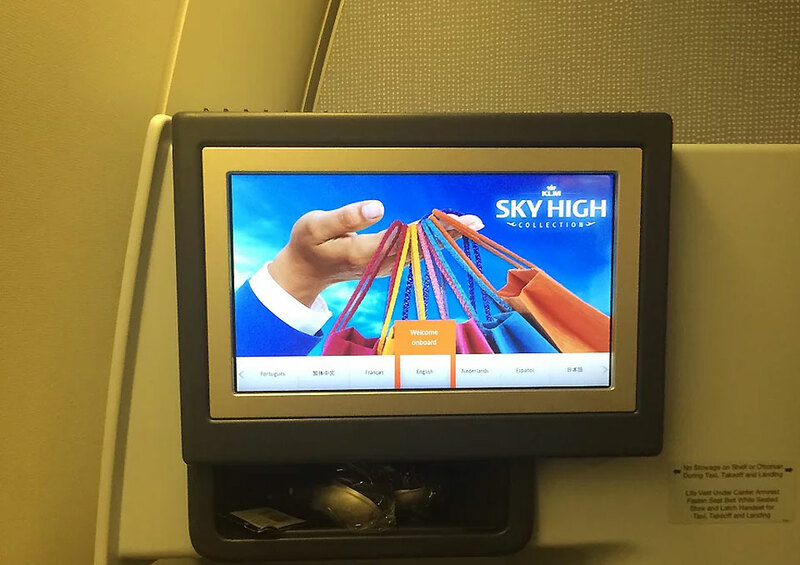 The system featured the latest flicks on the flight. KLM also provides business class passengers with noise-cancelling headphones. Passengers can control their entertainment system using either the touchscreen itself or using a simple handheld remote. 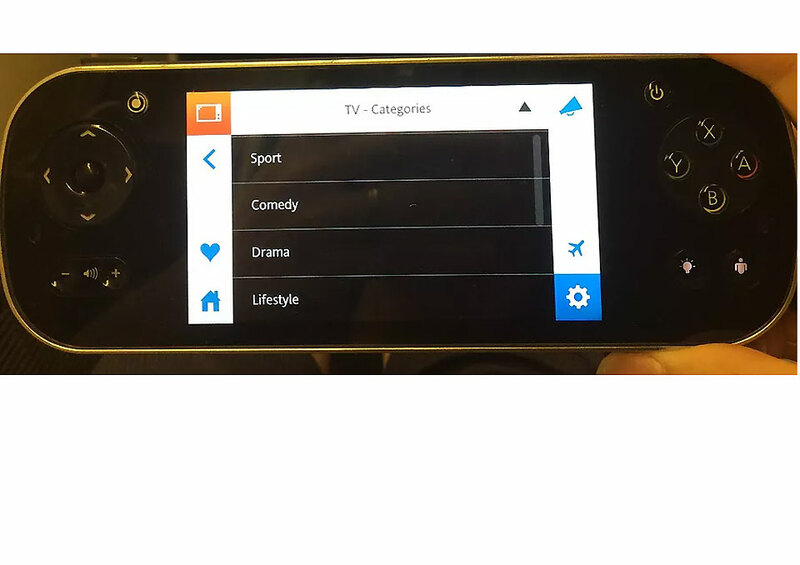 The remote is a good size more the size of a phone that allows to watch content on the device itself or the main screen. 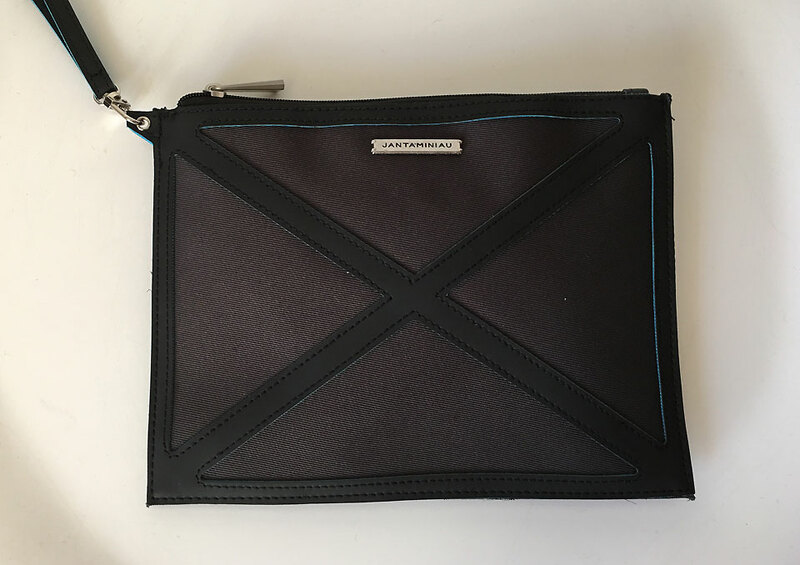 The amenity kits aboard my flight were understated square pouches designed by Jan Taminau containing a toothbrush and toothpaste, a comb, earplugs, an eye mask and socks. There were no skincare products included. 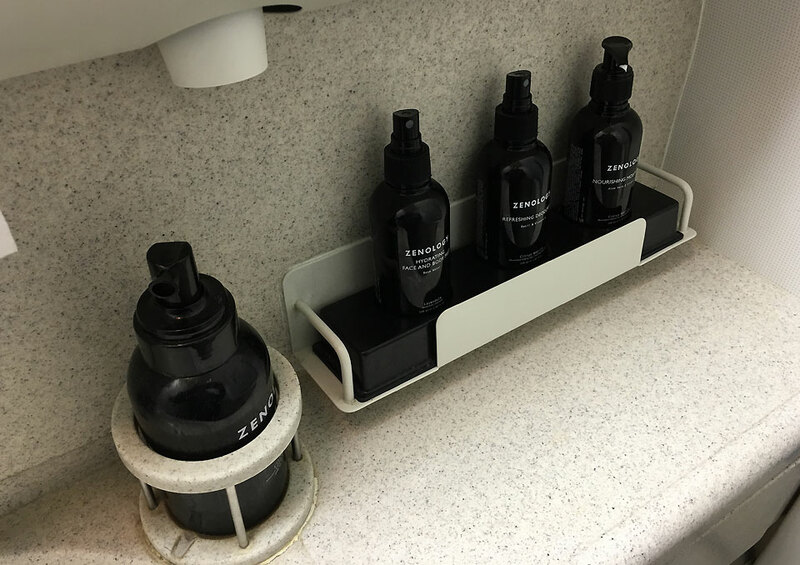 The lavatories contained Zenology products including moisturizer, deodorant spray and facial mist. 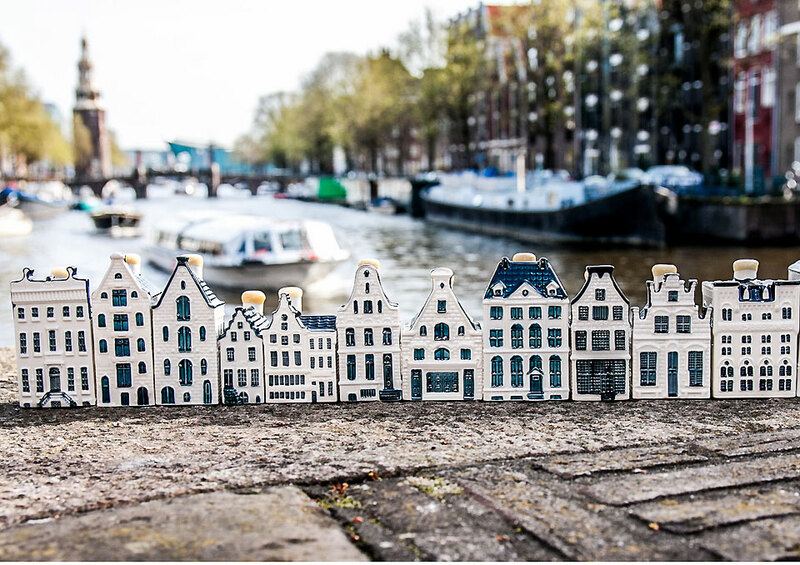 Signature to KLM is the hand out of beautiful Delft blue ceramic houses filled with Dutch Bols gin. There are 96 of them to choose from – one different in each flight. 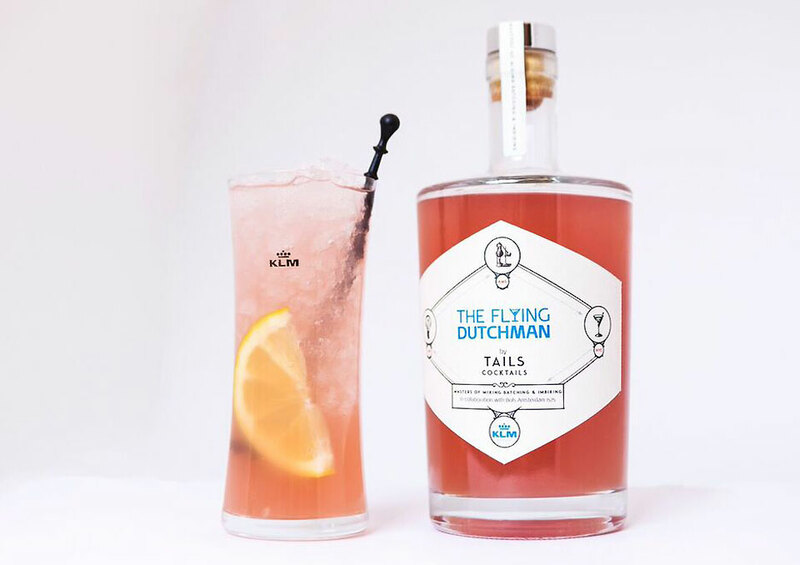 It’s is inspired by an actual historic house in the Netherlands and legendary Dutch Gin. 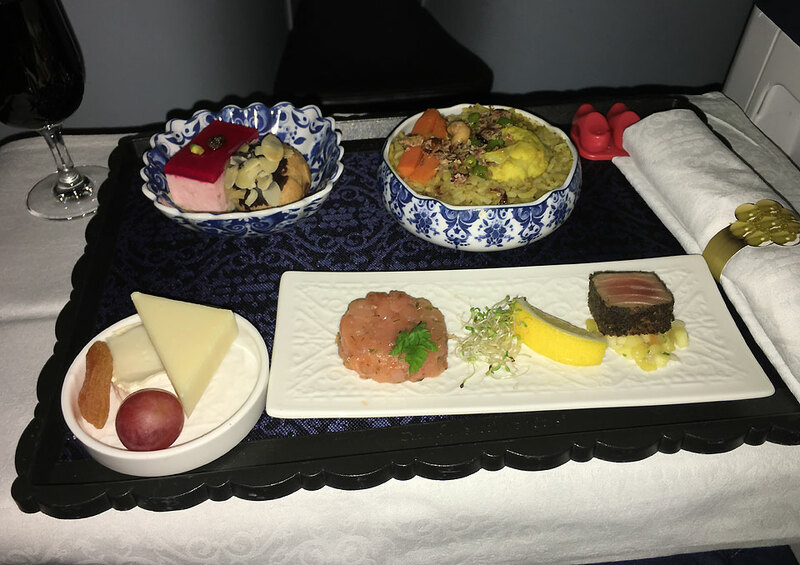 Top food and wine is coupled with legendary KLM service. Sharp and attentive, the crew in the business class were on hand to ensure that business class passengers had the best possible experience. As the head purser introduced himself, he reminded on the salient features of the business class seat ensuring that guests had a good nights rest and were full appraised with the seat controls. A gesture I thought was a great way to break the ice and familiarise with the passengers on board. KLM offers seamless connections to travellers from New Zealand to Europe via the Netherlands. 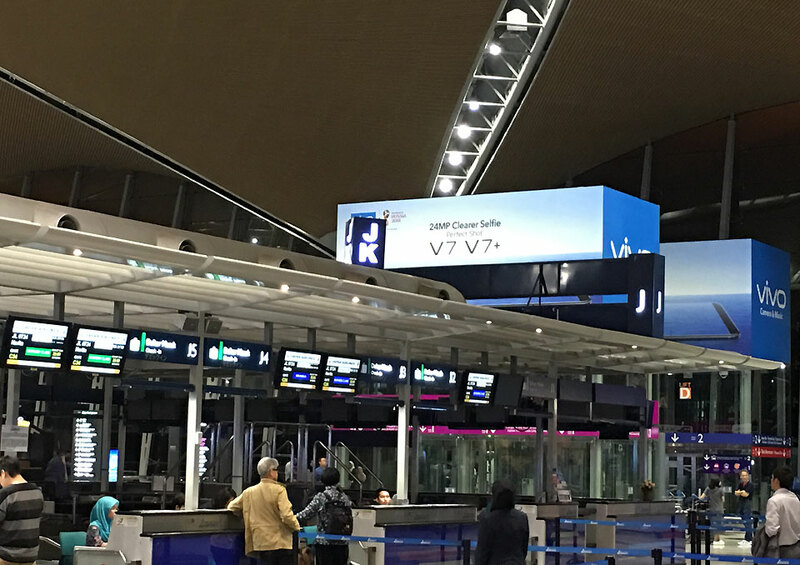 Whether its taking a flight from the US or Asia, KLM covers multiple stopover points to get to Europe. They have an update fleet with the latest jets and the service is sharp. I certainly recommend KLM for the business traveller as the product is comfortable and consistent. 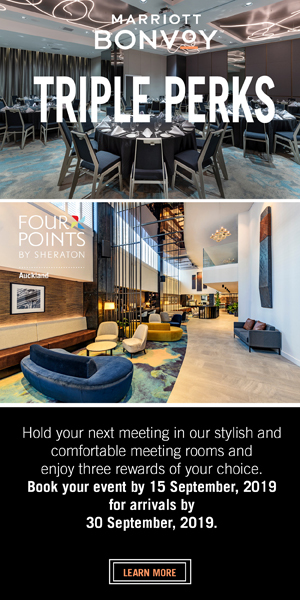 And the advantage of multiple stopovers from New Zealand makes it easy and flexible to plan itineraries.